After competing in various bodybuilding competitions, Jeremy turned to powerlifting while attending Florida State University in Tallahassee, Florida. After one year of entering the sport, he broke three national records and broke a world record in benchpress at the age of 24. Competing in the 242 lb. 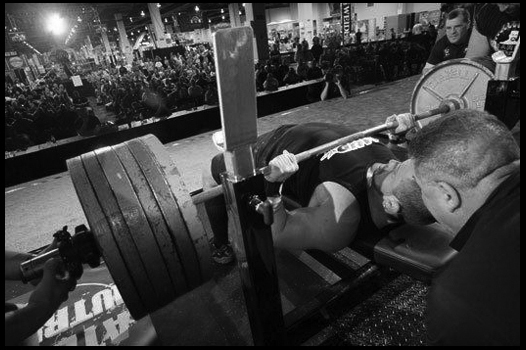 weight class, Jeremy broke Mike MacDonald’s longstanding Raw Benchpress record of 29 years with a 605 lb. benchpress at the New England Record Breakers Competition in Boston and increased that record to 615 lbs. at the 2006 Mr. Olympia Competition in Las Vegas, Nevada, then many times after that including a 617 lb at APA’s Ironfest and APA’s Raw Nationals with a 622 lb, 639 lb, again with 661 lbs. and finally setting the All-Time Bench Record for the 242 lb class with 663 lbs. He also set the All-Time Bench Record for the 275 lb weight class with 675 lbs. Jeremy has gym lifts over 700 lbs. including a 715 raw benchpress and is planning on hitting this mark in a competition this year. After High School, Jeremy got an A.S. in Fire Science and in Business Administration at Lake-Sumter Community College. After graduation, he enrolled in Fire School and EMT school in 2001. Upon receiving his Fire Certificate and Emergency Medical Technician certificate, he moved to Tallahassee to attend Florida State University. Jeremy graduated from FSU in 2006 with a Bachelors in Sociology, minor in Political Science, and a Bachelors in Interdisciplinary Social Sciences, minor in Business Administration. He is currently a Firefighter/EMT for Leesburg Fire Dept. in central Florida. For information on Jeremy’s competitive lifting history please click here. Visit Jeremy Hoornstra’s brand new Powerlifting Gym website for contact information, brand new store featuring his DVD “242 Raw” and training packages; coming soon new shirts and his new Ebook!! !